When I was a youngster, Christmas time was a highlight of the year and boy, was it special. Once you realized it was looming out there, mere weeks away, it seems that the clock slowed to a snail’s pace and you thought it would never get there. It always did. It wasn’t long before I realized that the magic of St. Nicholas was a spirit that we were responsible for keeping alive. If one is not careful and gets caught up in the buy, buy, buy pressure, the season can be very stressful. Been there, done that and it’s not worth it. Besides, if your extended family grew like mine, you could go nuts and bankrupt buying and wrapping something for everyone. We had some very dear neighbors in Baltimore with a large Catholic family. Their family photo looked like a school portrait. John and Joan Moag had six children of their own and, of course, an impressive number of grandchildren. None of the Moag family exchanged gifts. Instead, they pooled their money with checks from the adults and piggy bank savings from the kids and always came up with enough cash to fund a 1 year scholarship at a private middle school for inner city boys that had the aptitude and desire for a quality education but were without the ability to pay for it . I have always been impressed by that act of generosity. Living in the middle of Oregon wine country, I love coming across recipes that use wine and then starting a sometimes lively debate with my partner, Charles, about which of the many bottles of Oregon wine we have in our closet to sacrifice to the recipe. Thankfully, with a few exceptions, the recipes usually don’t call for an entire bottle of wine…leaving us plenty left over to drink with dinner. 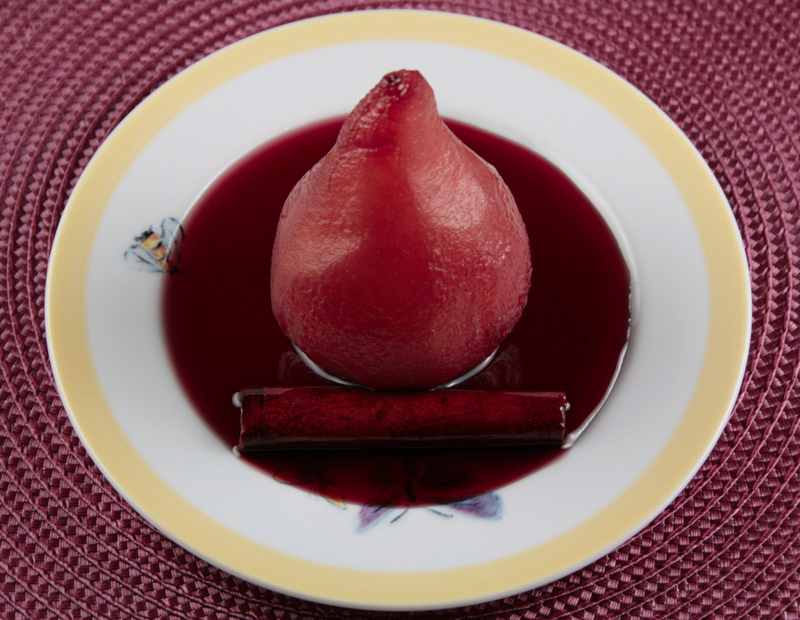 You don’t usually come across many dessert recipes that call for wine, however, but I remember the first time I had pears poached in a red wine sauce and thought it would be a perfect winter dessert. Into the coat/wine closet I went and out I came with a bottle of Redhawk Winery’s Grateful Red, a blend of pinot noir from seven different vineyards. It’s a very fruity pinot, with cherry flavors and a spicy finish, so I thought it would be perfect for my adaptation of the very common recipe. Note to self: This would be really dynamite to serve after Christmas dinner! Maybe I’m experiencing a sort of mid-life crisis, but whenever I’m in the kitchen cooking something I love, I experience a warping of the space-time continuum. 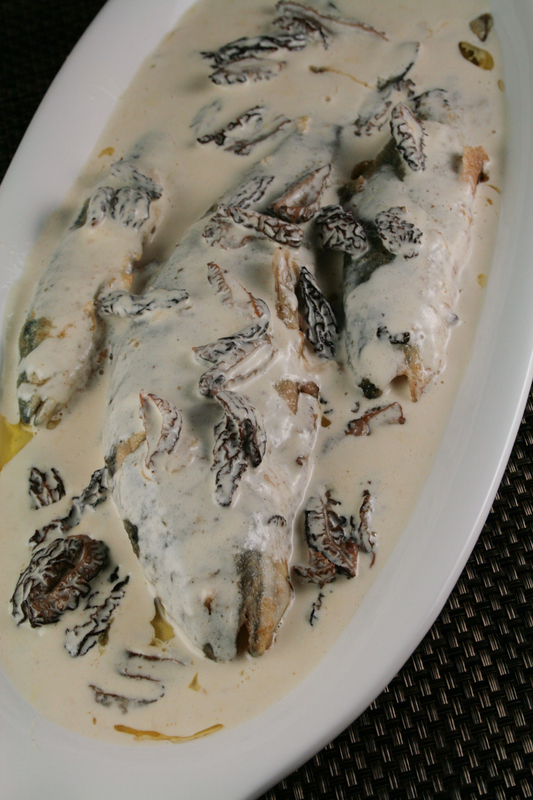 For instance, recently when I made Dover sole in a coconut curry custard wrapped in banana leaves and steamed, I was transported back to my childhood in Thailand when I was served the same dish and fell in love with it for the first time. I think cooking can do that for you. Transport you back to that first moment you fell in love with the dish you happen to be cooking. Whenever I make steamed blue crabs, I think of our days in Baltimore when we would go out with friends to crab houses and consume dozens of crabs steamed in Old Bay seasoning, cracking their tough shells open with mallets, our fingers burning from the spices, and drinking glasses of cold beer to wash down the salty spicy flavor. Whenever I steam Dungeness crabs, I think of the first time I had Dungeness in San Francisco on Fisherman’s Wharf, in view of the Golden Gate Bridge. I was recently thumbing through a cookbook from Ray’s Boathouse, a famous Seattle restaurant, and stopped when I came across their recipe for Dungeness Crab Cakes. I’ve eaten at Ray’s Boathouse only once. It was about ten years ago during a business trip to Seattle, and I remember the beautiful views of Puget Sound from my Westin Hotel room downtown. I remember going to Pike Place Market and losing track of time roaming the fascinating shops. I remember the lively urban street life and the delicious dinner Charles and I had at Ray’s Boathouse with one of my good friends. It made me wonder about that friend, wonder how she was doing now, years after she moved from Seattle to Milwaukee. 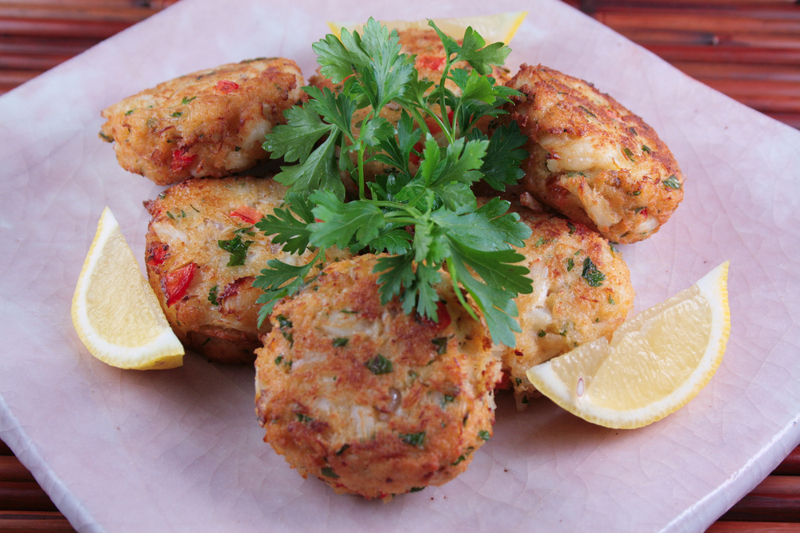 Happy in that memory, I decided to make Ray’s Boathouse crab cakes for my family for dinner. In a bowl, combine Panko bread crumbs, chopped red bell peppers, parsley, celery salt, Tabasco, ground black pepper, salt, egg, heavy cream, dry sherry, shallots and paprika. Mix well. Add crab meat and combine thoroughly. Form into patties with your hand and refrigerate for an hour. Heat the oil in a medium-sized skillet and fry the crab cakes until golden. Serve with lemon wedges and cocktail or tartar sauce. Adapted from Ray’s Boathouse Cook Book. Fishing is one of those activities that I’ve come to relish for several reasons. It gets me out in the mountains, streams, rivers and lakes, to the ocean, on the beach to surf fish, or on the many jetties that dot the coast to catch rockfish. It reminds me that nature is constant and, at the same time, changing. And whatever worries are on my mind, they inevitably fade away as the cityscape leads to rolling hills covered with Douglas fir and then on to the majestic snow-capped mountains of the Cascade Range or the forest-covered mountains of the Coast Ranges. In Oregon, I’ve found Zen in fishing. Plus there’s the added benefit that the locations for the best fishing usually have the worst cell phone reception. During both of my furloughs from work this year, I made a sign to hang on my computer. It simply said: “Gone Fishing”. But my passion for trout fishing is equaled by a passion for digging up recipes on preparing trout. There are only so many times that I can bring home my fresh catch and simply smoke them or pan fry them in butter before culinary boredom strikes. So last weekend, before heading off to one of my favorite trout-fishing spots, Detroit Lake, I headed to our shelves to retrieve a book I purchased when we lived in Fort Worth, Texas. I was drawn to Château Cuisine because it is not only about French cooking, but also details the rich history of the many famous châteaux that dot the country — complete with beautiful photographs that would make anyone want to hop on a plane and visit France. I also chose the book because French cooking had always intimidated me. Reading French recipes, even in Mastering the Art of French Cooking, I sometimes feel too inept to attempt the recipe. It’s almost like the French think you have to be worthy of French cooking…so one must practice a few times before a recipe truly reveals itself. Our usual holiday group scattered this year leaving us to fend for ourselves on Thanksgiving. No problem! We began dreaming about our options of letting someone else pamper us with dinner at favorite restaurants that we visit on special occasions. That’s when we thought of Jory Restaurant, a new one for us. Fortunately we called in time to score a 7 PM table at the newly opened restaurant in the equally new Allison Inn and Spa in Newberg, Oregon. It was a wise choice. Our expectations were met with traditional Thanksgiving fare carried out with the creative touches of Executive Chef, Nathan Lockwood and served with relaxed, friendly attention. Perched majestically on a hill just above Newberg, the much anticipated Allison Inn and Spa reigns supreme as a premier resting place for anyone looking to spend a relaxed Oregon sojourn exploring all that the Willamette Valley has to offer, especially the famous vineyards of Yamhill and Polk counties. The resort is named for Allison Lake which once held the Willamette Valley under about 400 feet of water. Jory is the name of the rich soil deposited and left from this period of Oregon’s geological history. This same soil allows the resort to grow it’s own produce on a 1-acre plot as well as its own herb garden. In the Northwest, one of the signs of winter, besides the gathering gray rain-laden clouds, is that persimmons start showing up at the grocery store. Personally, I think these wonderful fruit are under-appreciated . In Asia they’re considered a delicacy and it’s something that we look forward to in our household every winter. Persimmons are grown in Oregon as well as California. There are two general varieties of persimmons—those that are astringent until fully ripe and those that are not astringent. The astringent varieties are generally rounder and aren’t sweet until they’re completely soft. The non-astringent varieties are flatter, apple-crisp and sweet while maturing. The non-astringent varieties are the ones our family prefers. They’ll also hold up to baking because they’ll retain their firmness even after baking . The California Rare Fruit Growers’ Web site has more information on persimmon trees and varieties you can plant if you want to grow your own. 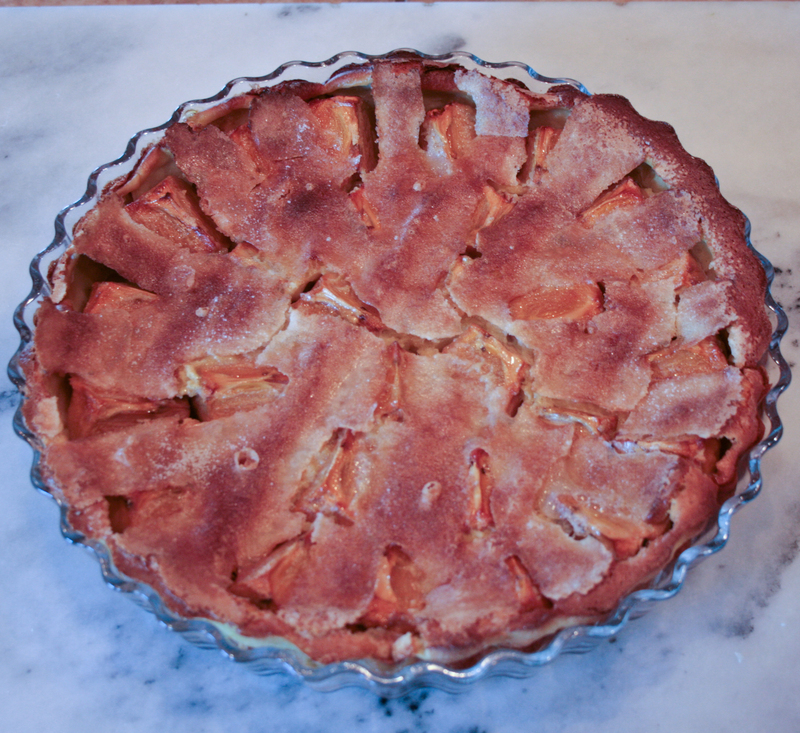 Besides peeling them and enjoying them raw, one of the ways you can enjoy persimmons is to use them in a clafouti. Clafoutis are easy to make and can be made with a variety of fruit, including cherries and pears. You can enjoy clafouti with ice cream or a dollop of whipped cream. To take it over the top, pour yourself a nice ice wine-style wine. The sweetness of ice wine and its bright acidity will pair nicely with the clafouti. Some excellent ice wines from Oregon include Adelsheim Pinot Noir De Glace, King Estate Vin Glacé and Argyle Minus Five. Ice wines are traditionally made in Germany using grapes that are left on the vine to freeze and then they’re crushed. The juice is concentrated because the water in the grapes is frozen. In Oregon, it doesn’t get cold enough so wine makers give nature a hand by freezing the grapes after they’re picked. Preheat oven to 350 degrees (190C or Gas Mark 5). In a blender combine the milk, sugar, eggs, vanilla, salt and flour and blend at the highest setting for about 1 minute. Lightly butter a 7- to 8-cup (1.5- to 2-liter) baking dish or pie plate about 1 1/2 inches (4 cm.) deep. Pour a 1/4 inch (1/2 cm.) layer of batter in the baking dish or pie plate and put it in the oven for two to three minutes until the batter sets in the bottom of the dish. Remove from oven. Arrange persimmon wedges in a circular wagon-wheel pattern. Sprinkle another 1/3 cup (80 ml.) of sugar over the persimmons and then pour the remainder of the batter over the fruit. Place the pie plate in the middle of the oven rack and bake for about an hour. The clafouti is done when it has puffed up and browned on the top. To test, stick a toothpick in the center of the cake and remove. If it comes out clean, without any batter clinging to it, the clafouti’s done. You can serve the clafouti warm or at room temperature. As the clafouti cools, the cake will sink slightly. My favorite way of serving clafouti is with a scoop of vanilla ice cream. “The above transcription, translated here from the original Latin, is engraved on the front of the magnificent Flemish Renaissance building that stands in the heart of Brussels on Grand Place. The building is called Maison des Brasseurs, and it is the brewers’ guild house, a splendid architectural testimony to the importance of the brewers and the influence of the brewers’ guilds in the life and history of Belgium. Our experience of frequent dining at The Brewer’s Art in Baltimore and re-creation of their Shellfish and Potatoes Steamed in Belgian-style Ale inspired me to delve further into Flemish cooking with beer. 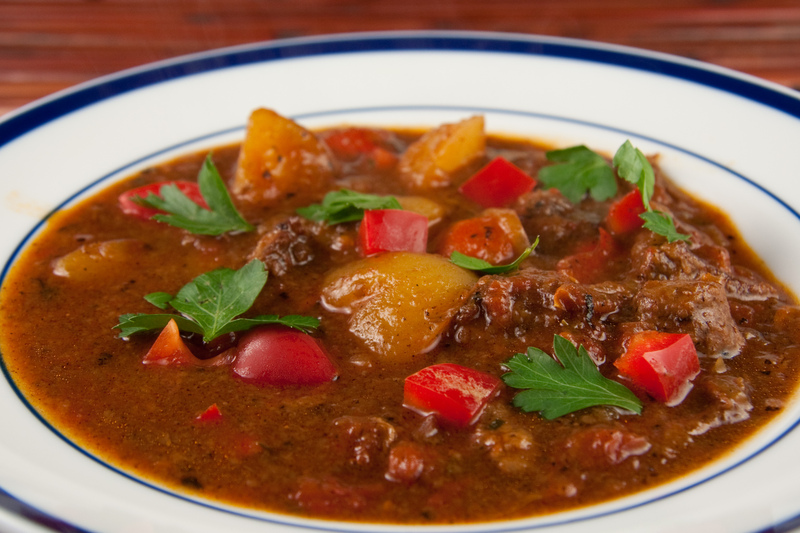 What better place than Oregon to explore cooking with beer as well as wine. We are home to some of the finest Pinot Noir and Pinot Gris vineyards as well as a plethora of excellent micro-breweries, many of which pay homage to the mother country of beer with various expressions of that style of brewing.